Hoverboards are increasingly becoming all the rage, with different new designs popping up every now and then. But none of these boards actually seems to do what their name suggests they do: hover. Now the aerospace company Arca Space is pushing its new ArcaBoard Hoverboard as a board that actually hovers over different terrains. The ArcaBoard is nothing like all the sleek hoverboards you may have seen; it looks less attractive. The board features a look similar to that of a doughnut box with many holes, which house fans that power it. The ArcaBoard Hoverboard measures 145 x 76 x 15 centimetres in dimension and tips the scale at about 82 kg – this is surely not something you want to be keeping in your backpack and hit the road with. However, Arca is not really trying to sell its ArcaBoard based on claim of elegance. 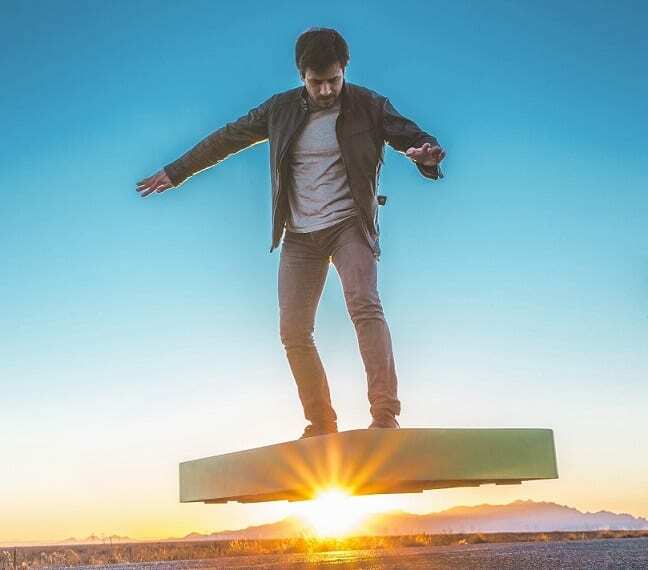 It wants to push the hoverboard to people based on its ability to let users ‘ride across any terrain or water.’ The board can supposedly hover as high as a foot over a surface. To make this possible, Arca has fitted the hoverboard with 36 high power electric ducted fans (EDFs) that deliver up to 272 horsepower. The fans combine to produce up to 200 kgf (430 pounds) of downwards thrust to keep a user afloat for entire battery runtime. The ArcaBoard has an integrated stabilisation unit that helps to keep it stable while up in the air. Heat generated while using the board is dealt with by a powerful cooling system. You will be able to control this hoverboard using your body or a Bluetooth-linked app available for Android and iOS devices. Juice is supplied to the board by batteries that last about six minutes on the version for lightweight individuals and three minutes on the version for heavyweights. It takes a whopping six hours to get the batteries charged. But if you are willing to shell out $4,500 (almost a quarter of the ArcaBoard’s price) more for an optional ArcaDock accessory, charging time can be significantly cut down to 35 minutes. ArcaBoard Hoverboard is available at a price of $14,900.